Congratulations on making your first step in accepting credit cards! It’s a zoo out there! You have many choices. We realize this. So, we’ve created something simple and competitive. Whatever you want. Sometimes plan A works for you, and sometimes plan B is better, or vice versa. 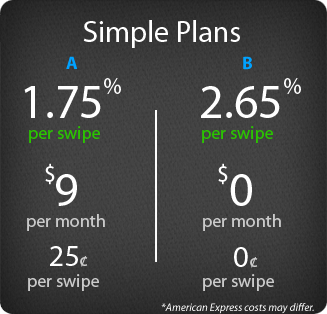 Either way, and anytime, you may select the plan that best fits you. There is no obligation period, either way — you can cancel at any time. Ameribanks offers merchant accounts, cutting-edge technology and secure credit card processing at competitive rates to meet the individual requirements of our clients, and we’ve been doing it consistently since 1994. Our goal is to be your first choice for industry-leading electronic payment processing that’s reliable and secure, customer service that delivers beyond expectations and budget-friendly pricing for all your credit card processing needs. In simplest terms, a merchant account is a business arrangement with a credit card processor that allows a merchant to accept credit card payments from customers. The processor equips the merchant with the necessary technology, handles the authorization of sales transactions by the issuing bank and deposits the proceeds into the merchant’s designated bank account. Learn more about merchant accounts here. As an experienced and reputable merchant services provider, Ameribanks can set you up with a merchant account for credit card processing that best suits your specific requirements. We offer a complete menu of merchant services including a variety of merchant accounts (retail POS, Internet, wireless, mobile), plus state-of-the-art technology, PCI-compliant secure processing, toll-free 24/7/365 U.S.-based customer support and quick approval of your application — all at competitive rates. From the very beginning, we’ve based our business on the pillars of honesty, integrity and outstanding customer service that have earned us an A+ rating for Customer Service and Trust from the Better Business Bureau. We have worked with hundreds of thousands of diversified clients from coast to coast in the United States — businesses large and small, merchants and service providers, from traditional retail to e-commerce, mobile to mail order and beyond. As a full-service merchant account provider with years of experience in the credit card processing industry, we know there’s a lot of competition out there for your business. We also know that the strategic alliances we’ve built with established networks and banks in this country make it possible for us to offer merchant accounts that can truly save our clients money on their processing costs. Plus, every transaction processed through a Ameribanks merchant account is supported by the most robust networks available. So read more about Ameribanks and our merchant account options on this website, and then talk to one of our trained representatives about your business and your specific credit card processing requirements. Learn for yourself how we deliver the expertise, products and services that you need at prices you can afford!